This week’s feature is a mouthful, one unlikely to be spoken while browsing the plant racks at Home Depot or even on the tables of your better nurseries. It’s not particularly showy or amazing, but all the same it’s showy and amazing and I’m glad to have it here in the garden. Allium flavum ssp tauricum, a range of pastel flower colors as well as a range of foliage colors, from straight green to blue-gray. 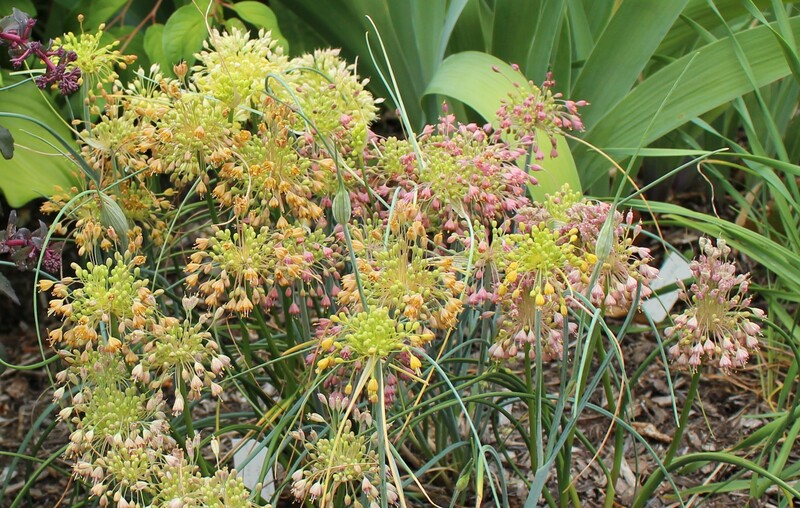 This small, summer blooming allium is one of those onions which may surprise gardeners who typically think of flowering onions as mostly purple, and mostly late spring bloomers, but here it is in all its early summer, pastel tones. Mine came via the North American Rock Garden Society seed exchange (another mouthful) and were labeled “ex McDonough”. For those of you not in the onion know, Mark McDonough is the onion man, essentially a global authority on all things allium and if you’re interested he hosts a website called PlantBuzz to which I heartily recommend a visit. If you can’t find anything interesting on his site I’m going to guess you stopped reading my post after the first few sentences, but if you’re still with me give it a click… if only to look at wonder upon the different forms of even something as simple as chives! 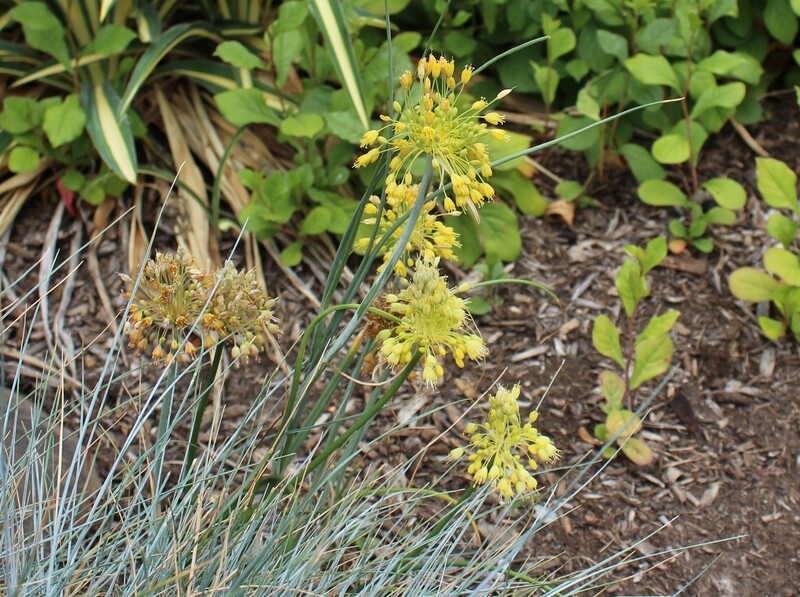 Regular plain old Allium flavum (yellow onion) doesn’t have the range of pale, pink, and rusty tones which the subspecies tauricum shows, but I think they’re both equally easy to grow. Mine were planted in February of 2013, the pot went outdoors and the seeds came up that spring. The first flowers showed the year after and other than digging and spreading the clump out a bit two years ago they’ve been plugging along in a full sun spot ever since with no help from me. Last year’s seedlings blooming for the first time… less diverse, but still nice! For as easy to grow as they are you would think they could be a pest, but I have yet to see a single seedling come up on its own. They just politely do their thing and all I do is clean up a few dead leaves and flower stems once flowering is finished… they are an evergreen onion, so there’s some foliage all year even after things die down a bit in August. Keep your eyes open for A. flavum ssp tauricum and grab it if you have the chance. Also if you have the chance, give Cosmos and Cleome a visit to see what Kimberly and other bloggers are featuring this Thursday. Each week she encourages us to focus on a single plant and it’s fun seeing which favorites show up on other gardener’s blogs You’re more than welcome to join, and if you do leave a link on Kimberley’s blog so we can come find you! 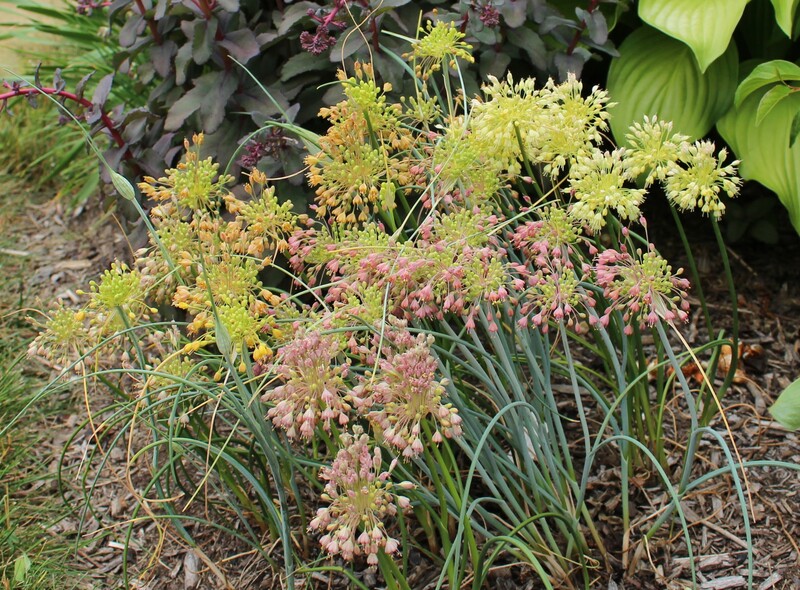 This entry was posted in early summer, perennials, summer bulbs, thursday feature and tagged allium, flowering onion, summer flowers, thursday feature. I’ve been adding a few new onions as well. I held off for years since I thought of them as weedy looking, but it looks like my tastes have changed! Good choice of plant, not one I think many people will know. Generally Alliums need more water than they receive in my garden but that doesn’t stop me admiring them. Opps! Which is rock underneath but friable on top, very free draining and full of nutrients. If I tell you that the fig looks stressed suddenly through lack of water it will tell you just how dry it becomes. I think I have a few bright yellow Allium Flavum that I bought in a Boy Scout bulb sale some years ago, and they always surprise me when they show up, which is not necessarily every year! They did show up this year, amidst a jumble of stuff in the rock garden, and finished blooming about a week ago. I think they’re sometimes sold as “Fireworks Allium.” I like yours, in those pastel shades. Being so subtle, they would definitely need to be planted en masse and in their own specific spot. Thanks for introducing us to them, and I’m sure the Onion Man will be surprised by al the new hits his site gets! So I just went to PlantBuzz, and got all excited because it promised a section called “Cleome Studies”! Imagine my disappointment when I clicked on it, and the page was empty! : ( The Allium pictures are gorgeous, though. I’ve seen a few cleome species here and there, they are some cool little plants! Your yellow allium might also be a. Moly, it grows here as well but has already bloomed and just went dormant, so it’s a little earlier. Yes, this one really needs a good companion to set it off or it gets lost in the mulch. The dark sedum I have next to mine seems to work well though. … I don’t think my blog has quite that much influence, I’d be surprised if even just a few clicks end up going the onion man’s way! I love Alliums and try to plant some every year. It is amazing how many different alliums there are. It’s fun to get some unusual ones! I like the gray-green foliage of those. I have a few different ones including a burgundy-colored one that I love. I just saw some enormous ones at a botanical garden in Maine recently, with blooms bigger than my head. Impressive for an onion! In my opinion the enormous ones are by far the best! I hope you are able to post a few pictures from Maine. I’ve heard so much about their botanic garden, and I love that area in general. I have never grown it but saw it in a garden I visited last week. It is a interesting plant. I am glad to see you are also a member of NARGS. I joined many years ago for the seed exchange but I have been to some of the annual meetings which are usually in interesting locations. I joined NARGS just a few years ago after looking over the seed exchange and thinking it might be a fun member benefit. There was no interest in alpines or rock gardening at the time, but now that I’ve got a few curious little plants growing along I’m really considering adding a spot where they can grow on safely… and after reading the latest Quarterly edition I might even try making a trough!